First thing, I opened Resource Monitor and looked at the overall load. 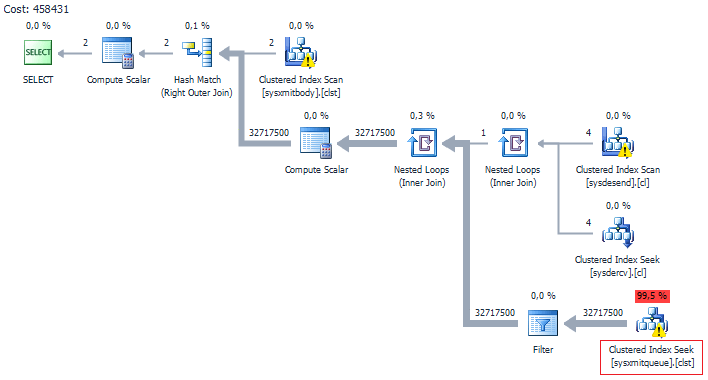 The sqlserv.exe process took up 100% of CPU and generated a large disk queue exceeding 300… whereas the number greater than 1 is considered problematic. The data file takes up 42 GB… After a small break, I began to investigate the reason for such «unhealthy» size of msdb, and how to overcome the problems with server performance. I am referring to CDC (Change Data Capture), which is used as a tool for capturing data changes. CDC is based on reading the transaction log and always works asynchronously through the use of Service Broker. Upon sending Event Notification to Service Broker, the message may not reach the destination due to configuration problems, and then it is archived in a separate table. In general, if Service Broker is frequently used, you need to monitor state of sys.sysxmitqueue. When there is constant increase of data in the table, it is either a bug or we use Service Broker incorrectly. I must say that we will not leave all the tables in this list without attention. But first we need to fix issue with sys.sysxmitqueue. We cannot delete data directly from sys.sysxmitqueue, because this table is a system object (S). After some searching, I found a way how to get SQL Server to clear the table. When creating a new Service Broker, all the messages associated with the old broker will be deleted. The system database msdb is used by many components of SQL Server, such as Service Broker, SQL Server Agent, and Database Mail. It is worth noting that there is no ready-for-use service plan, which would take into account the above-mentioned, so it is important to perform regular preventive measures. In my case, after deleting the unnecessary information and shrink the file, the size of msdb became 200 MB against the original 42 GB. I hope this post will make an instructive story about the benefits of a permanent administration of both user and system databases. Very useful article, many thanks ! well explained and with a lot of very usable code to help me get on top of my msdb housekeeping. Excellent ! The advice ‘does what it says on the tin’ , and helped me to save a DB from bursting. Cheers!